The Ferrari 312T won the '75 F1 World Championship. Ferrari were glad about that ... it had been eleven long years since the last one! Of course, having Niki Lauda do the driving had helped. But he would have been first to acknowledge that a fellow member of the Ferrari team deserved due credit. Mauro Forghieri had designed the 312T's engine. The slimmer bores of the Ferrari flat-12 - relative to the V-configured layouts of other teams - allowed for higher engine speeds. That meant more power! It also meant more fuel consumption - so the 312T had to hit the grid heavier than its rivals. It fell to the Ferrari strategists to erase that handicap as the race went on. They clearly made a good fist of it ... Lauda won three consecutive races. He had added two more by season's end. Mauro Forghieri's masterstroke was his positioning of the 312T's gearbox. The horizontally-opposed flat-12 set-up meant the motor's mass could be moved lower. That meant better handling. A little twitchy, at times, perhaps - but, a big improvement on the Ferrari 312B3's under-steer. Forghieri took the weight distribution factor one step further. By placing the gearbox behind the engine, mass was centralised - as well as lowered. The 312T now manoeuvred as well as it went! At the start of the '76 season, the 312T won another three back-to-back GPs. But, '75 had been the car's finest hour. 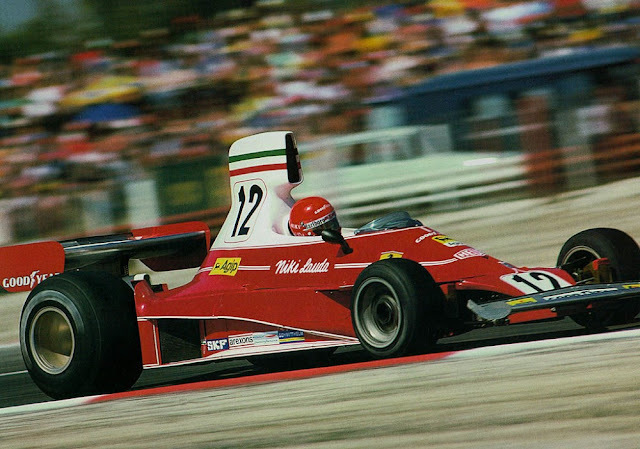 Niki Lauda - and team-mate Clay Regazzoni - had done the 'prancing horse' marque proud. On top of being one of the most iconic Ferrari race-cars ever built, the 312T was a great all-rounder. As such, it pointed the way to the fully-integrated future of F1.